All fireworks need two things to work; a chemical that is oxygen rich (called an oxidizer) mixed with fuel (something that burns, such as sulfur or charcoal). At a specific temperature, well above the boiling point of water, the chemicals react to release heat and produce color, light, and sound effects. The chemicals can be mixed together to produce different effects. For example, smoke is often produced by burning fireworks. When fireworks are used indoors, they are manufactured to produce a minimum amount of smoke. These are called proximate, or theatrical fireworks. 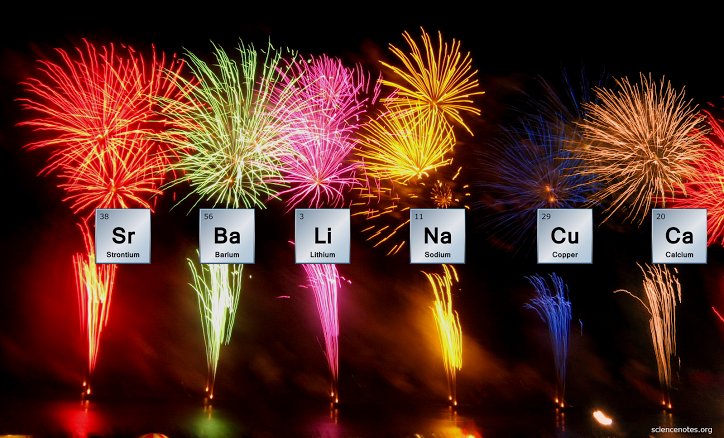 Fireworks contain various chemicals that when heated to high temperatures give off light to get rid of excess energy. Each chemical produces a different color.